Giving Courage to "Captain Jack"
Five-year-old Jack started feeling sick and complaining of excessive thirst and hunger. His mom Erin suspected something was wrong and took him to his pediatrician who, after his blood glucose levels registered high, advised them to go to the emergency room. Diagnosed with type 1 diabetes, Jack was admitted to the hospital for four days. He didn't understand what was happening and kept asking if he could go home. "He would hide underneath the bed, he was so scared," Erin says. The child life team at AMITA Health Alexian Brothers Women & Children's Hospital in Hoffman Estates helped Erin and her young son brave their fears. 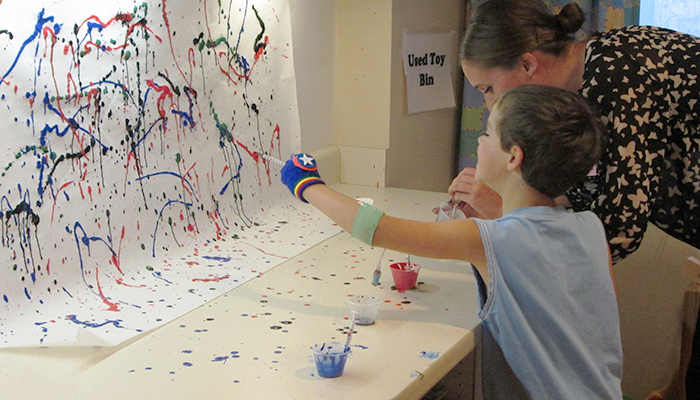 They played and painted with Jack. They made him a doll on which to practice giving shots. When they learned he loved Captain America, they started calling him "Captain Jack." They even made him a special pair of "superhero" gloves, trimming off the fingertips so they could test his blood glucose. "He wore them every single day for two months," Erin says. In addition to their care for her son, Erin is grateful for the support and reassurance they gave her. "They went above and beyond. I don't know what we would have done without them." Please make a gift today to provide children like Jack the care and support they need. Thank you for your generous support!